Are you considering a new metal roof for your home in Oshawa? If you’re reading this, you’re already taking the first step in the process: research. There are many benefits to installing a metal roof on your home. In this article by Metal Roofing Solutions, we will take a look at some of the benefits of having a new metal roof installed on your home. Read on for more information. 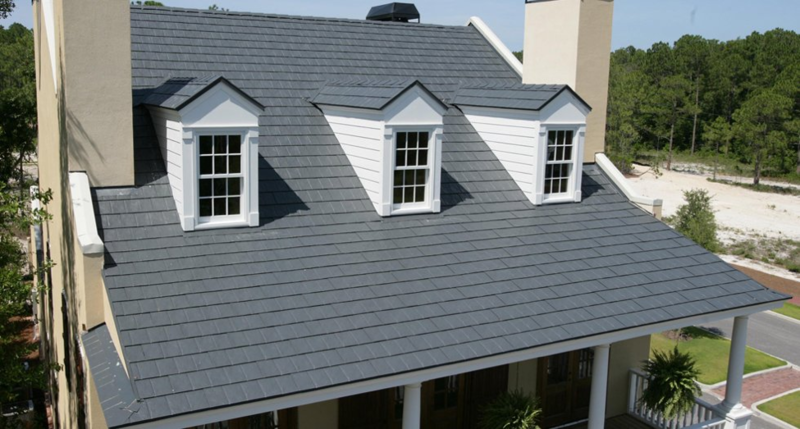 Click here to get a free online quote for your new metal roof! Most new metal roofs come with a long warranty. What is more important; however, is the lifespan. Every other roofing product has a warranty that is prorated because the typical life expectancy is LESS than the warranty length. With metal roofing it is the opposite. Whether the metal roof is stone coated or painted, the life expectancy is typically 50 to 70 years. If you purchase a metal roof, you shouldn’t need to replace the roof for the rest of the time you own that home. Metal is a fire-resistant material and, in fact, metal is considered a Class A fire resistant material. Having a fire resistant roof gives your home a better chance of surviving a fire or slowing down a fire. There is no product more resilient than metal roofing material. Steel shingles and their Class 4 impact rating will often result in lowered homeowner insurance premiums. Steel shingles, either painted or stone coated, also maintain their appearance better than any other roofing product. Installing a metal roof adds major resale value to the home. A metal roof is preferred over a different type of roof because a home buyer knows there would be no maintenance necessary before moving into the home. For a new roof in Oshawa, metal is the way to go these days. A metal roof is an excellent insulator and saves money on heating and cooling. Compared to an asphalt roof which is a paper based material, a metal roof is a proven to withstand harsh weather like storm, strong sun, and high winds. Metal roofs have a higher solar reflectance and heat dissipation rating than asphalt shingles which directly impacts your heating and cooling costs. If you are looking into getting a new roof for your home in Oshawa, then a metal roof from Metal Roofing Solutions is the way to go! For more information about the benefits of a metal roof, or about our metal roofing material and installation process, please feel free to continue browsing through our website. Click here to find our contact information and to fill out our contact form.